"The western Antarctic ice melt was unprecedented. We’d never seen anything like this in the past 25 years." 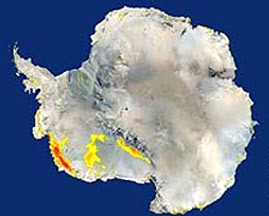 Yellow and red colors on western Antarctica indicate where NASA's QuikScat satellite in January 2005 detected snowmelt by radar pulses that bounced off ice formed when snowmelt refroze. The unprecedented ice melt was equal to the size of California. Image courtesy NASA/JPL.